From a new set of wheels to a tune-up for your own bike, the Manna Bikes team and our full-service bike shop can meet all your cycling needs. Need a tune-up or some repairs? Bring your bicycle in for repairs and receive one-on-one customer service. 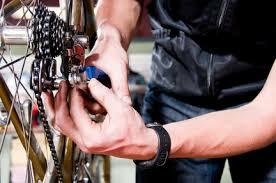 Some of our services include: breaks, chains, shifters, tire tubes and bike wash. Looking to purchase a bicycle? Save money by purchasing a restored bicycle. Come in and check out our inventory of discounted new and restored bicycles. We accept all types and styles of adult and children's bicycles. Our facility is all about "Restoration". Donate your bicycles and help us continue in the restoration process!